From pizza to pillows and tech, these are the best Pi Day deals for a happy 3.14! Happy Pi Day 2019. Whether you're in the market for $3.14 pizza or one of the best discounts on the top-selling pillow on the market, there are plenty of price drops to celebrate today! What is Pi Day and why is it so special? It's all about the date. The March 14 date resembles the ratio of a circle's circumference to its diameter, which is 3.14159265359, 3.14. It's also Albert Einstein’s birthday. Pi Day is a popular topic of discussion online, so online stores create Pi Day deals to intercept search traffic and reward shoppers with great deals. Pi ties in to Pie, which means you'll find deals on both pizzas and desserts. And while Pi Day is traditionally known for deals on pizza and pie itself, lately it's become a great sale day with many other companies capitalizing on the momentum. You'll find the best deals listed below and although some of the pizza offerings may be from a store outside of our region, I'm listing them in the event you are traveling or have a family member in that area! Click on the links for more details about each deal. DEALBOSS will continue to update this list; reload for the latest deals! Bertucci's: Buy one large pizza, get one for $3.14 using code PIDAY online. BJ's Restaurant and Brewhouse: $3.14 mini one-topping pizzas. Blaze Pizza: $3.14 for custom-built pizzas at more than 314 locations. California Pizza Kitchen: $3.14 Key Lime Pie at participating locations. 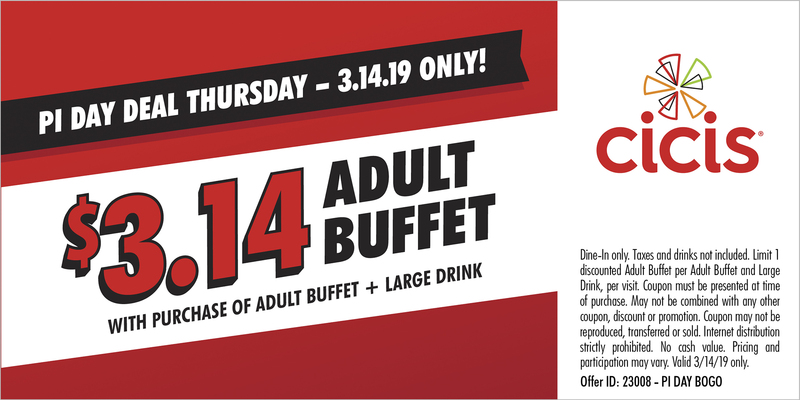 Cicis Pizza: Buy one adult buffet and a drink, get a second adult buffet for $3.14 with this coupon. Kroger: Select pies are $3.14 which is 30 percent off at select locations. Marie Callender's: Buy one adult entree and get a free slice of pie with this coupon. &Pizza: $3.14 off all pizzas via Uber Eats app with coupon code PIDAY19. Pieology: Buy one artisan thin crust pizza and get a second for $3.14. Villa Italian Kitchen: $3.14 whole cheese Neapolitan pizzas with a coupon you receive when signing up here. Whole Foods Market: $3.14 off select bakery pies at participating locations. Your Pie: $3.14 10-inch pizza at participating locations. Pur-Sleep best-selling sleep pillows: $31.40 on sale (Was: $99.99!). Backpacks: $31.40 for these best-selling backpacks today. Boston Market: BOGO — Buy a pot pie and a drink, get a second pot pie free. Fast wireless smartphone chargers: $31.40 on sale (Was: $50). Origin Salad Dressing & Marinades: $31.40 big two packs (Was: $50). ThinkGeek.com: 31.4 percent off select merchandise with code PIDAY19. White Castle: Breakfast slider combo for $3.14 with this coupon.